One of the problems writers struggle with is character differentiation. This is especially true when you are writing a group of characters who are very similar to each other. Often they end up sounding and acting like clones of each other—at least in first draft. I feel this problem is more prevalent in middle grade, because the child protagonist often has siblings who share a home, a culture, and many of her life experiences. Even at school, middle graders often find themselves among a group of friends from their immediate neighborhood, who also often have similar home lives and experiences. So how does one keep from having the protagonist’s group moving in unison like a school of fish? By careful observation. 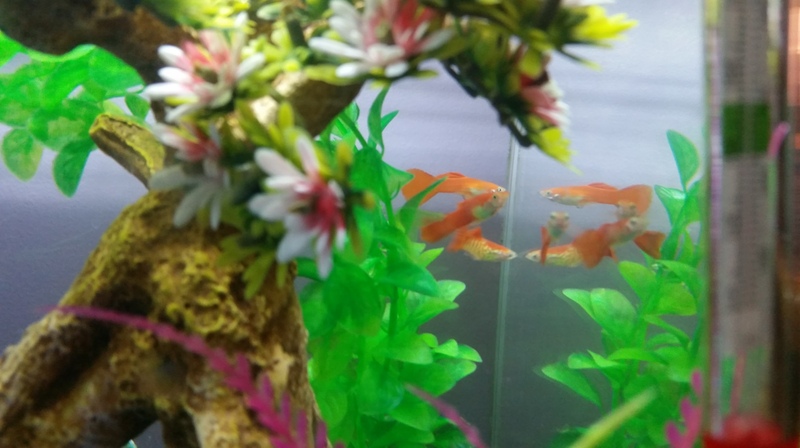 We have had fish for a little over two years now. Guppies. All male, all orange-gold. At first glance, they look the same, with little to distinguish them. But if you look a little closer, differences emerge. Some have different markings. Some have luxurious fins. Some have narrow bodies. Their personalities are different, too. We have had 8 fish total. Seashell, an explorer who sought the world outside his tank, with the predictable tragic results. Sparkleshine, a bully of a fish whose aggression eventually led him to an early demise. Flower, a placid, beautiful fish with flowing fins who didn’t want to fight but would. Seashell 2, a scrappy little fish who survived for weeks after his tail fin rotted away. Gem, the peacemaker, who would interpose himself between Sparkleshine and the fish he was attacking. Seashell 3, a solid chunk of a fish who thought he was a 1.5 inch swordfish. Glimmer, self-important and aloof. And our current sole survivor, MiniSeashell (aka Seashell 4), who in the world of social guppies is a raging introvert. Fish have personalities. Who knew, right? I wouldn’t have known without careful observation, and that may be the secret of character differentiation for you. Look at your seemingly homogeneous group of characters. Watch them. See how they act. Then sharpen their differences until you have a group of unique people who happen to populate the same space. A master work of character differentiation is S.E. Hinton’s The Outsiders. At first glance, her group of boys seems alike—poor white boys from the same part of a distressed Oklahoma town, tough greasers all, and three of them brothers to boot. But look a little closer and she gives you as varied characters as you could wish for. Ponyboy, looking for a better life outside his reality and finding tragedy. Dallas, aggressive and angry and destined to die young. Sodapop, a pretty boy with an edge that came out when required. Darry, toiling for a better life for him and his brothers. And Johnny, the introvert who just wanted to have peace. Even the more minor characters have their own unique selves. I don’t know if these characters came to Hinton as unique individuals or if she had to work at it. I do know that I have had the experience of having a group appear on my page like a homogeneous school of fish. If you also have that problem, look closer. Look deeper. Sometimes this means putting the characters into different situations outside the story, either on paper or just as a thought experiment, to see how they react. For me, I usually have to write the story to the end before I really know my characters. However you do it, look closer. The differences are there, waiting to be discovered. Do you struggle with character differentiation? What tips and tricks do you use to tease out the personalities?